Developing treatments is challenging for scientists, as these conditions are caused by more than 4,000 different gene mutations. But many of these mutations have something in common—a propensity for creating misfolded proteins that cells in the eye can't process. These proteins build up inside cells, killing them from the inside out. Now Duke University scientists have shown that boosting the cells' ability to process misfolded proteins could keep them from aggregating inside the cell. The researchers devised and tested the strategy in mice, significantly delaying the onset of blindness. Their findings are outlined in the journal Nature Communications. Their approach potentially could be used to prevent cell death in other neurodegenerative diseases, such as Huntington's, Parkinson's and Alzheimer's, said Vadim Arshavsky, Ph.D., senior author of the paper and Helena Rubenstein Foundation Professor of Ophthalmology at the Duke University School of Medicine. "You can offer almost nothing in terms of treatment to a patient with retinitis pigmentosa or other inherited blindness today," Arshavsky said. "This investigation provides evidence that enhancing the capacity of the cell to process misfolded proteins is worth pursuing. 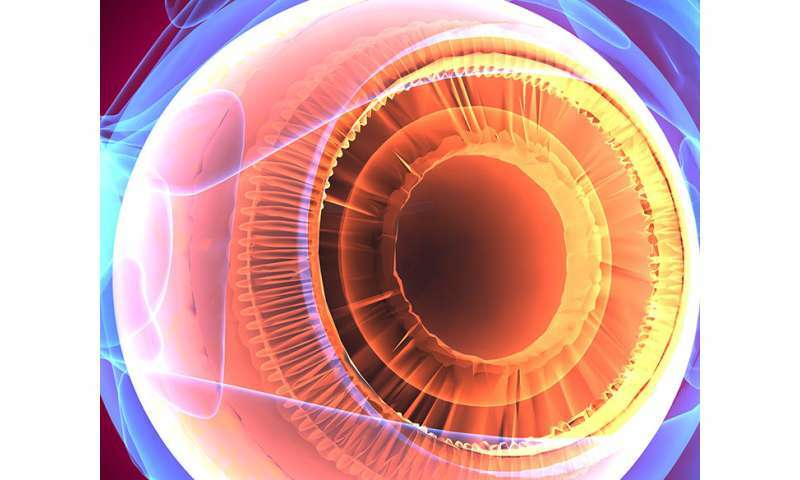 Another important piece is that inherited blindness is just a subset of a larger category of neurodegenerative diseases, so this concept could be tested in other conditions, as well." The Duke team collaborated with colleagues from the California Institute of Technology. They focused on the proteasome: machinery inside all cells that eliminates misfolded proteins. Arshavsky compares the barrel-shaped structure to a paper shredder, with the cutting elements hidden inside. Misfolded proteins must pass through a "lid" on the shredder to be processed, but cells in diseased mice do not have enough lids, enabling the buildup of the damaged proteins. Instead of trying to alter the shredders, Arshavsky and his team genetically increased the quantities of lids for the shredders, allowing cells to process more misfolded proteins. In trials, mice with added proteasome lids retained four times the number of functional retinal cells by adulthood than mice with the same form of retinitis pigmentosa, which went blind as adults. The lids were introduced genetically in the line of lab mice. In humans, lids could potentially be added through gene therapy or drug compounds. "If you can retain four times the number of the functional cells in the eye, that would mean decades more vision in a human patient," Arshavsky said. "It's not a complete cure, but it's a tremendous delay. This type of treatment has the potential to defer the onset of blindness beyond the human lifespan."